Zimbabwe Bulawayo blast: Two die after attack on Mnangagwa – Royal Times of Nigeria. 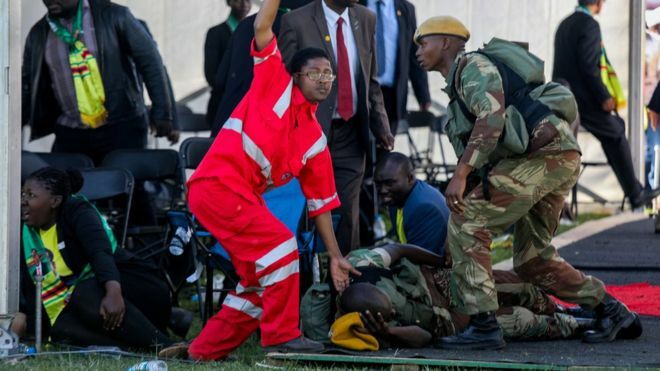 Two people injured in Saturday’s explosion at a campaign rally in Zimbabwe’s second city of Bulawayo have died, a medical official has said. At least 49 people, including President Emmerson Mnangagwa’s two deputies, were injured in the blast. The president said it was an attempt on his life ahead of the election on the 30th of July. Mr Mnangagwa has vowed that the attack would not derail the election. In a statement, he said an object exploded a few inches from where he stood. He is favourite to win the poll, but analysts say he also has enemies – both for overthrowing his former mentor, and for being a previous enforcer of Mr Mugabe’s government.